Cleaning wipes are great for dusting, sanitizing surfaces, or absorbing small spills. Since they're so versatile, you can use them in your kitchen, bathrooms, dining areas, and waiting areas. Our bar towels are made of soft and absorbent cotton, making them ideal for cleaning up spills in your bar or restaurant. You can even find some that are color-coded to prevent cross-contamination. Also make sure to check out other great items from Choice, 3M, Carlisle, Chicopee, Royal Paper, Scrubble by ACS Industries and Unger. Cleaning pads are essential cleaning items in any food service business. These tools will help you wash dishes, disinfect tables, and mop up spills more thoroughly and efficiently. 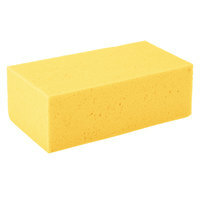 Choose from commercial sponges of different materials to find the best one for your cleaning tasks. Use our scouring pads for difficult jobs like scrubbing grease off of your range. Whatever your cleaning chores, we have the supplies you need! Check out our green housekeeping chemicals, food service chemicals, and sanitizing chemicals for other disinfecting products. If you're wondering where to buy carlisle scrubbers, sponges, and wipers, we have a large selection of carlisle scrubbers, sponges, and wipers for sale at the lowest prices.